Foundation design requires a thorough understanding of structural loads and settlement limits as well as the characteristics of soil and rock at the construction site. D'Appolonia routinely plans and executes site exploration programs to identify key soil and rock strength parameters and to collect other key data related to the depth of the ground water table and variation of subsurface stratigraphy over the site. We design foundations that meet design requirements in a cost-effective manner. Often it is economically prudent to improve site conditions prior to construction. We have developed and implemented programs for many types of foundation improvement technologies including dynamic consolidation, stone columns, soil mixing, and grouting. Compaction grouting being performed at coal preparation plant site. 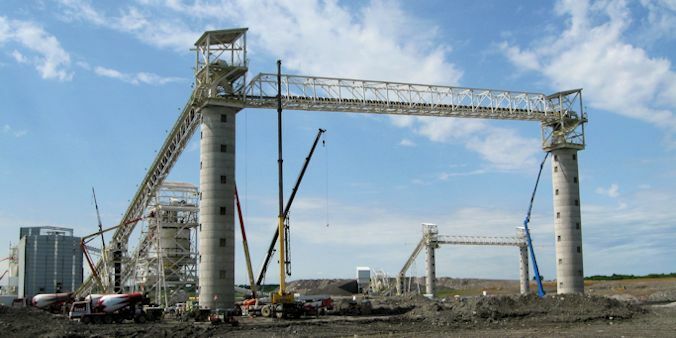 A coal preparation plant with below-grade coal conveyor tunnels and 105-foot-high stacking tubes was built on a previously strip-mined site. The site had been reclaimed by placing excavated overburden rock and mine spoil into the mined areas, creating a mixture of highly varied soils and rock fragments to bedrock, 165 feet below ground surface. During construction, differential settlements of 3 to 4 inches occurred beneath site coal handling tunnels. Based on the design loads, final settlements in the range of 12 to 24 inches were projected. D’Appolonia developed a mitigation plan using compaction grouting. The degree of in-situ soil improvement was a 3- to 4-fold increase in the soil modulus. The grouting operation halted differential settlement allowing the tunnel conveyors to function properly. D’Appolonia served as a subcontractor to Washington Group International, Inc. (WGI) for providing geotechnical consulting services related to ground improvement for industrial structure foundations for the Common Sulfur Project (CSP) in the State of Qatar. D’Appolonia’s scope of services for the project was to evaluate subsurface conditions at the CSP site and to make recommendations such that settlement and bearing capacity criteria for the heavy project structures were met. D’Appolonia provided guidance as to the location and spacing of points for vibro-compaction and reviewed the results of the field effort. Our personnel visited the site and provided data review and guidance on secondary compaction locations. D'Appolonia was retained to perform a geotechnical field exploration program and to provide foundation recommendations related to construction of a coal loadout facility at a mine site in Southeastern Ohio. We recommended that the structures be placed on deep foundations extending to bedrock or to a depth sufficient to gain the required support. We provided recommendations for bond strengths, allowable factors of safety and lateral load capacity for the drilled shaft alternatives. D'Appolonia performed foundation evaluations for a 100-acre coal transhipping facility adjacent to the James River in Newport News, Virginia. The site was underlain by a 25-foot-thick layer of sand, silt and clay dredged from the river and placed by hydraulic filling over sand sediments. Unequal placement of coal in piles caused severe local lateral ground displacements and intolerable distortion of rail tracks. D'Appolonia developed a design to eliminate the problem utilizing 300 stone columns installed to an average depth of 20 feet. D’Appolonia was retained by the Burgettstown Area School District to perform a geotechnical exploration for construction of a major addition to the Burgettstown Middle/High School building. Our test borings indicated that mine workings were only partially filled and that the backfill material provided little or no support to the mine roof. D’Appolonia subsequently prepared plans and specifications for construction of low-mobility grout columns in the mine to permit building construction on shallow foundations. We also provided construction monitoring services during implementation of the grouting program, as well as during site grading and foundation construction. D’Appolonia was retained to perform foundation investigations for expansion of a recreation building complex that was undermined. D'Appolonia's project responsibilities included determination of the extent of undermining; developing remedial measures; preparing design drawings, construction specifications and bid documents; screening potential construction contractors; selecting grout materials compatible with mine water chemistry; and providing construction management for all phases of a mine filling program. D’Appolonia was retained by a client seeking to build a 90-MW cogeneration plant near Yuma, Arizona. The proposed plant site was characterized by loose to medium dense, well-rounded sands to a depth of 20 feet below the ground surface. Surficial soils needed to be compacted sufficiently to support a boiler, turbine generator, and fuel storage tanks. D’Appolonia developed and implemented a soil consolidation program that involved dropping a 13-ton weight from a height of 82 feet using a large crane. D’Appolonia directed subsurface explorations and prepared recommendations for the design of foundations for 37 microwave communication towers for Allegheny Power Systems. The 3-legged and 4-legged unguyed towers ranged in height from 30 to 280 feet. The project sites were located in five states and exhibited widely varying subsurface conditions.